The time had come. Our biggest adventure yet was about to begin. The crown jewel of our week in Belize, and an adventure we still talk about today. We were about to embark upon an adventure that would find us up close and personal with an ancient civilization. 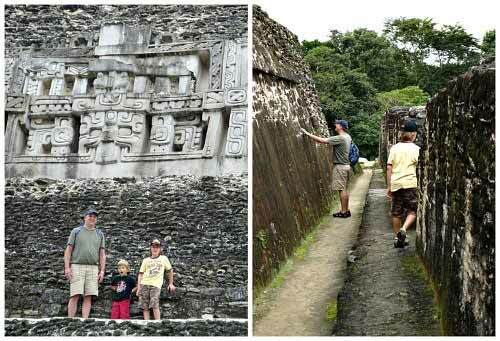 Step back in time with us as we spend our final day exploring two Mayan masterpieces buried deep in the jungles of Belize - Xunantunich and Cahal Pech. Welcome to Xunantunich, where Mayan royalty once performed ancient rituals high up on ceremonial platforms. Where, at it’s peak, nearly 200,000 Mayans lived beneath the shadows of a towering pyramid called El Castillo. Welcome to an adventure sure to intrigue and mystify the whole family. Just getting to Xunantunich is an adventure! Climb aboard this old-fashioned hand-cranked ferry, car and all, and journey across the Mopan River, straight into an ancient world time appears to have forgotten. Yes, for real. That ferry is hand cranked via tow ropes across the river. 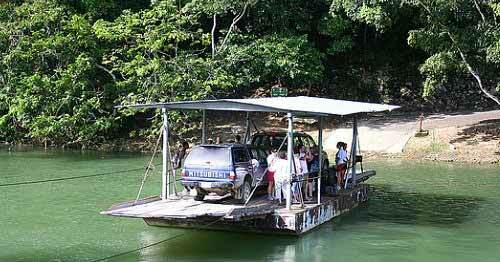 Unless you plan to swim across the Mopan River, this ferry is the only “road” to the Xunantunich archaeological site entrance. And I really don’t recommend swimming. 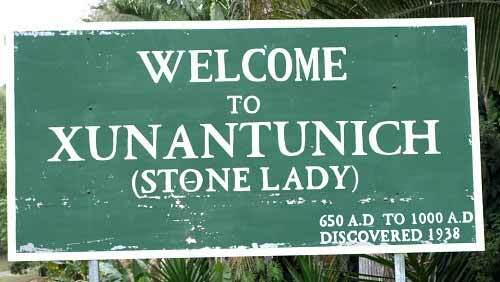 Once back on terra firma, Xunantunich is only a short mile away. Leave modern civilization behind as you traverse through a jungle road to the archaeological site. Suddenly, there it is. Xunantunich and it’s towering temple, El Castillo, just off in the distance, peaking out from the depths of the jungle that once overtook this site. Begin your exploration at the Xunantunich Visitor Center. Learn about the ancient Mayans that once called this land home. Then, step through the time portal, straight into an ancient world eclipsed by time and jungle growth. Climb to the top of El Castillo. Just take care to not disturb the ruins. Oh, and if exploring with young children, you may want to think twice about taking him to the top. It’s a very steep, narrow climb. Enough to give a mother heart palpitations! Stand atop El Castillo, soaking in the breathtaking views that surround you. Imagine yourself transported back in time to 1,000 years ago, to when Mayans ruled this land. Gaze out upon an ancient Mayan world, a civilization long since gone quiet. It’s as if time has stood still in this peaceful setting. Wander slowly back down the narrow walkways, taking time to discover the intricacies of an ancient Mayan temple. Stand beneath Mayan frieze more than a 1,000 years old. Meander along paths carved between stone walls high up in the sky. So close you want to reach out and touch. But please be careful. Remember – these ruins are truly ancient. How cool was that, standing atop a Mayan ceremonial temple! But there is so much more than El Castillo to explore. 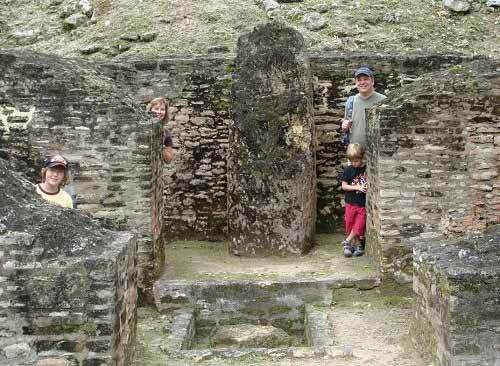 Contemplate life as Mayan royalty as you stand inside the ruins of a Mayan palace. Imagine this is your stone bedroom! Which bedroom would you choose? We all decided we preferred our own beds back home. Continue past moss covered stone structures. Examine crumbling walls that once housed the lives a civilization past. Walk on the grassy field of an ancient Mayan ball court, the very same court where Mayan ball games were sometimes played to the death. Yikes! I’ll stick to the sidelines, thank you very much. Next on our Mayan ruin adventure? Cahal Pech, Xunantunich’s “smaller cousin” just down the road. This exploration begins at the Visitor’s Center, before stepping back in time once again, right onto another ancient Mayan ball court. Though much smaller than Xunantunich, there is still plenty to explore at Cahal Pech. Walk along an ancient path where an elite Mayan ruling family once lived. Explore the remains of the royal palace. Wander through halls and bedrooms as a Mayan royal family once did. Hmmm. What do you think about that stone bed? Doesn’t look very comfy, does it! 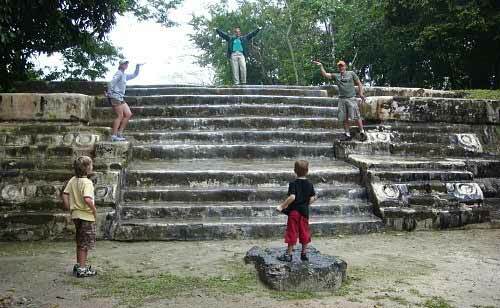 Climb the steps of the ancient ceremonial temple. Was this really where sacrifices took place? No evidence to such activity was found on this day, though not for lack of trying. And no, big brother, you may not sacrifice your little brother today. Did You Enjoy the Journey? And so ends this most adventurous day, as well as our Belize family vacation. I hope you enjoyed the journey. I know I sure did! 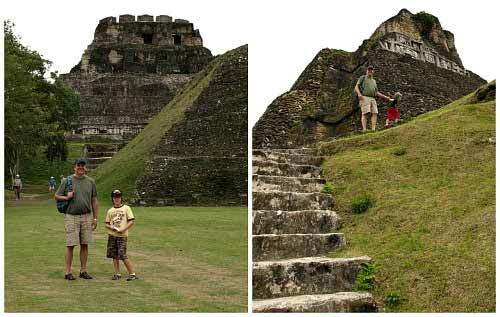 Belize remains one of our family’s most favorite destinations, and Xunantunich one of our most favorite adventures. Have you explored the ruins of an ancient civilization? 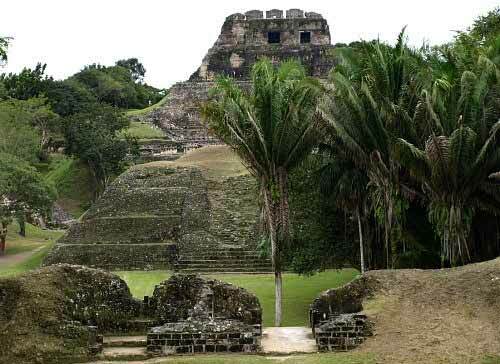 Have you been to Belize and witnessed the ruins of Xunantunich and Cahal Pech? Did you enjoy our journey through Belize? Let us know in the Comments! Xunantunich is an ancient Mayan civic ceremonial center located in western Belize, near the Guatemala border. It was occupied from 650 AD to 1000 AD. El Castillo stands 130 feet tall, and is surrounded by six plazas, more than 26 temples and palaces, and a Mayan ball court. Xunantunich was once the ritual center for Mayan rulers and elite. Now, it’s open to the public to explore how an ancient civilization once lived. 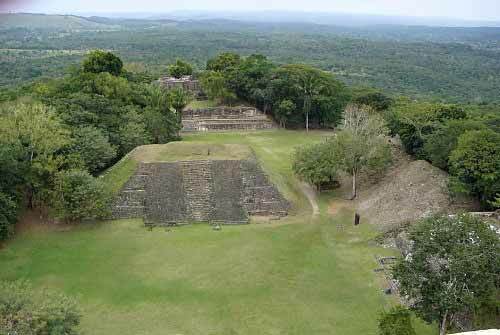 Cahal Pech was occupied from 900 BC to 1100 AD. It’s much smaller, with about three dozen buildings set around seven plazas. 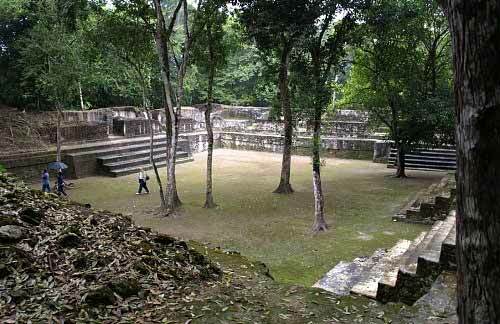 Cahal Pech was once the home of an elite ruling Mayan family. If at all possible, avoid visiting the same day cruise ships are in port. The ruins will be much more crowded. Book with a tour operator who can provide you with “non-cruise” tour days. Cruising to Belize? Xunantunich is offered as a day trip from most cruise lines. Both ruins are located just outside San Ignacio. If staying ocean-side, the excursion is doable, though plan for a long day. Guide? Or no guide? Your call. A private guide can provide historical facts and interesting tidbits that you might not learn otherwise. And they also know great places for lunch and where to stop if day-tripping from the beach! 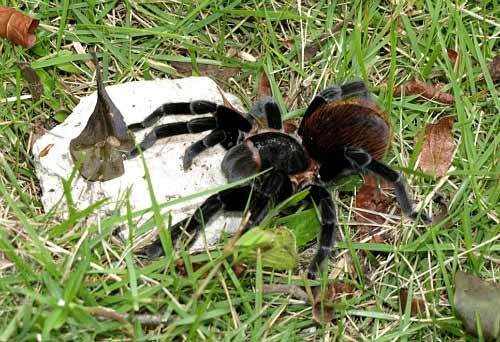 And your guide might just know where all the tarantulas are hiding! Who knows? He might just coax one out of his home for a closer look. We found this beauty while exploring the grounds of Xunantunich. No worries. Neither arachnid nor human was harmed in this adventure.